Ab Baars' trio Fish-Scale Sunrise, named after a poem by Wallace Stevens, signals a broadening spectrum of possibility for Baars’ composition and improvisation. Utilizing the piano, featured for the first time in an Ab ensemble, allows a new weight to nuances of timbre and dynamics as well as harmonic richness rivalling that of an orchestra. The drummerless setting draws the music out of the jazz idiom, giving the bass a unique place in the overall sound. The ensemble performs original compositions by Baars alternated with free improvisations. ... a very successful concert that displayed Baars' unique style of playing and composing in a new light. The excellent company often sounded enthusiastic and confident, but just as often sketching and searching, intimate and emotionally charged. Dutch reedist Ab Baars is a unique and prolific contributor to the European creative improvised music scene. His music has been characterized as joyfully obstinate, but surely appealing and as colorful as it is astonishing. It embodies the best typically Dutch improvised music has to offer. Although he seldom uses recognizable song forms or ongoing swing rhythms, the music stays catchy because it is stripped to the essence and clearly presented. 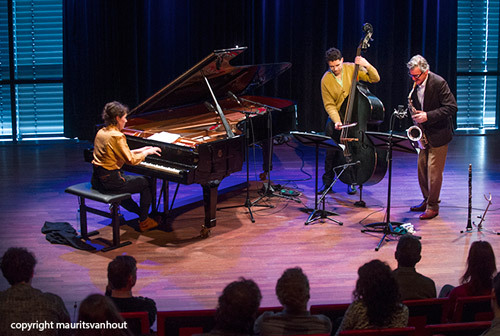 Baars is involved in a number of ensembles including the Ab Baars Trio, Duo Baars-Henneman and the ICP Orchestra. He is also an accomplished solo performer. The young Slovenian pianist and composer Kaja Draksler made a big impression with her first solo recital at the Amsterdam Bimhuis and with her solo debut album 'The Lives of Many Others' on Clean Feed (2013). 'Draksler brings austerity, subtlety, and poignancy with her fluid piano playing, and rings through in bright rich textures'. She works with her BadBooshBand, the duo Cudars-Draksler and several other groups. Bass player Joe Williamson, originally from Vancouver, is known for his work in adventurous groups like Trapist and the Tobias Delius 4tet. He regularly plays solo concerts: ‘Joe Williamson’s bass has a gloriously full sound, enveloping the listener as he bows out thick swathes of deepness’ (BBC).